There are fresh, local, sweet, strawberries everywhere this time of year. On Sundays, there's a farmer's market just around the corner from our home. In takes just a few minutes to hold a quart in my hands. We eat them plain, but really, they are so good with added sugar on top of a sweet biscuit with just a dollop of whipped cream. Sigh. However, rather than indulge in a sweet shortcake, I made this card, using Beautiful You by Altenew and a sentiment from The Stamp Market's Bows For You. The striped paper is from a digital collection from the company formerly known as Pink Petticoat. It closed up shop, but I was delighted to see that the owner/artist has reopened under the name, The Lovely Studio. Gorgeous designs. Just wish the designs were stamps! I lightly watercolored right over the striped paper. MOOD WHEN DONE = Happy to be back stamping. Between health stuff and traveling, I've been out of the loop for way too long. Speaking of health stuff, it's official. I've turned into someone who pretty much just talks about her health. Mike and I are trying to have "medical talk free days," because, honestly, I am so boring that even I am tired of the subject. Nevertheless, here I am on the blog talking about it anyway because that's what this anxious person does. The short version is that the medication I took in order to avoid heart surgery ultimately did not work. Surgeries are scheduled for August. A few days later, there will be a "small procedure" where they'll remove the defibrillator that I had put in last year and put in a pacemaker (and possibly another defibrillator -- I just can't go there right now). The pacemaker is necessary because the first surgery will block the electrical current on the left side of the heart and, since I'm already missing it on the right side, my heart will be unable to beat without a pacemaker (there is some mechanism to keep it going between surgeries). Do I trust medical device companies to keep my heart beating? I'm shocked that my MISTI is still working, so what do you think? Eeeek. I love fruit themed projects, yours is super sweet! What a great card, as usual Joan! feel free to talk medical to me anytime. Be a nurse, I live and breath medical! I know what you are going through must be scary as you know what, but I feel confident you will do awesome! Keep stamping, it is the great distractor. Adorable card! So sweet and pretty. And I would be like you - I have to talk about the things that worry med or else my head would blow up. Talk away - I'll listen. And say a prayer for you. Such a sweet little card! And you're right, it would be adorable in stamps. You have the right attitude...just stay positive. Sending a prayer for peace to get through all this. Love the "sweetness" of this card, Joan. Along with the others, don't mind hearing your medical journey. Sharing is a stress reliever. Keeps us from feeling alone. Will keep you in my prayers. Well, drat that you still have to have surgery. I think you should trust the pacemaker to do the job and the surgery will be a success. In the meantime, eat all the strawberries you want. 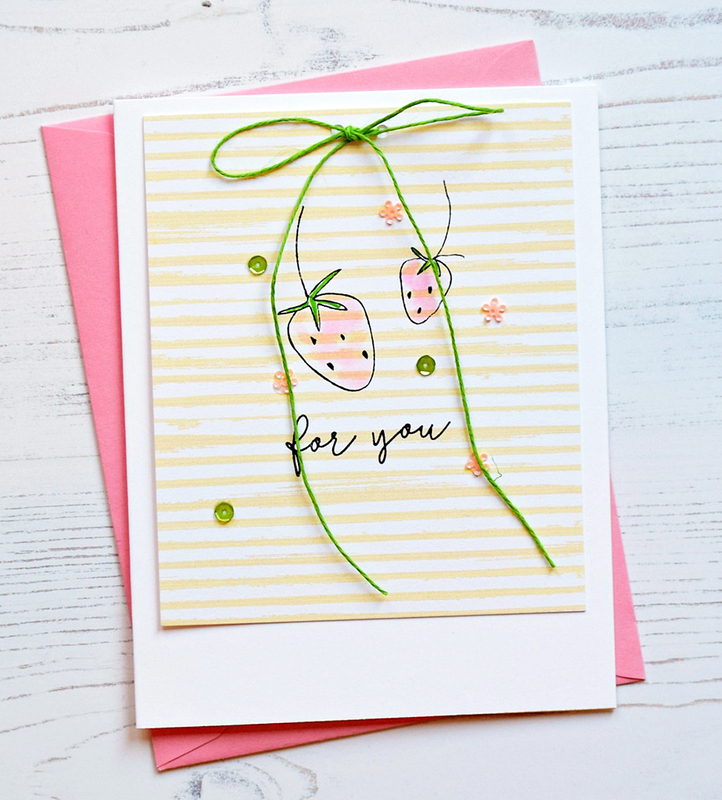 This card is such a pretty, sweet, and cheerful thing. I like the background. I never print digi papers as my current printer is an ink hog. Love this so pretty card! All the talk of strawberry shortcake has me pretty hungry tho. So sorry about the meds not doing the job. I will keep you in my prayers & hope that the pacemaker does the job right. What a sweet card! I am sure that I would indulge in the strawberry shortcake! So sorry about the medications not working for you. All the best with the surgeries and afterwards! Praying for you, Joan. That is a lot of information to carry and work through. Hugs! !